Acting Attorney General Matthew Whitaker speaks about the opioid crisis on Nov. 29 in Nashville. Three and a half weeks ago, President Trump appointed Matthew Whitaker as acting attorney general — and today he still has the job. He should not. Every day he remains in that position fundamentally undermines the rule of law in America. Since Trump fired former attorney general Jeff Sessions and gave the job to Whitaker, his chief of staff, the White House has given little indication that it is close to nominating a permanent replacement. That means Whitaker’s tenure is likely to last into 2019. This is a problem for a variety of reasons, but two obvious ones come to mind: Whitaker is manifestly unqualified to be the nation’s top law enforcement official; and from all appearances, he has the job, in part, to help impede the special counsel’s investigation into Russia’s meddling in the 2016 presidential election. Since his appointment, we’ve learned a host of disturbing facts about Whitaker. Before becoming chief of staff to Sessions, he served on the advisory board of a company called World Patent Marketing, which scammed inventors out of more than $26 million and was eventually shut down by the Federal Trade Commission. World Patent Marketing developed a reputation for threatening disgruntled investors — an activity in which Whitaker allegedly participated. According to new documents released by the FTC on Friday, Whitaker may have misled the agency’s investigators about his role with the company. Later he headed a nonprofit organization called the Foundation for Accountability and Civic Trust, or FACT, which described itself as a conservative, watchdog group focused on exposing public corruption and unethical behavior. However, FACT had no employees, its funding sources remain a mystery, and yet it compensated Whitaker more than $1.2 million over a three-year period. While Whitaker also briefly served as a US attorney in Iowa and had a small law practice, this is not the normal resume of an individual tasked with running the Justice Department. But what is of greatest concern about Whitaker’s background is his previous vocation as a paid talking head. In that role, and as an occasional opinion writer, he applauded the firing of FBI director James Comey. He also called for the prosecution of Hillary Clinton during the 2016 presidential race. Perhaps most disturbing of all, in a report by Murray Waas in Vox, while serving as chief of staff he allegedly “privately provided advice to the president . . . on how the White House might be able to pressure the Justice Department to investigate the president’s political adversaries.” That is almost certainly an abuse of presidential power and one in which Whitaker actively participated. It’s possible that Trump didn’t make Whitaker the acting attorney general in order to further obstruct the Mueller investigation and politicize the Justice Department. But it sure looks that way. Such apparent conflicts of interest are, in of themselves, a serious problem. The attorney general needs to be above reproach. When the meting out of justice looks like yet another political pursuit, it makes a mockery of the notion that America is a nation ruled not by individuals, but by laws. Whitaker is, from all appearances, a partisan, political operative. He’s not qualified for the job he holds — both because of his legal background and his political activities — and he may have conspired with the president to obstruct justice and use the Justice Department to go after Trump’s political enemies. From the firing of former Comey and the incessant attacks on Sessions, special counsel Robert Mueller, and his investigation, Trump has repeatedly demonstrated not just a deep and troubling disrespect for the rule of law, but a belief that the Department of Justice should cater to his political whims and needs. 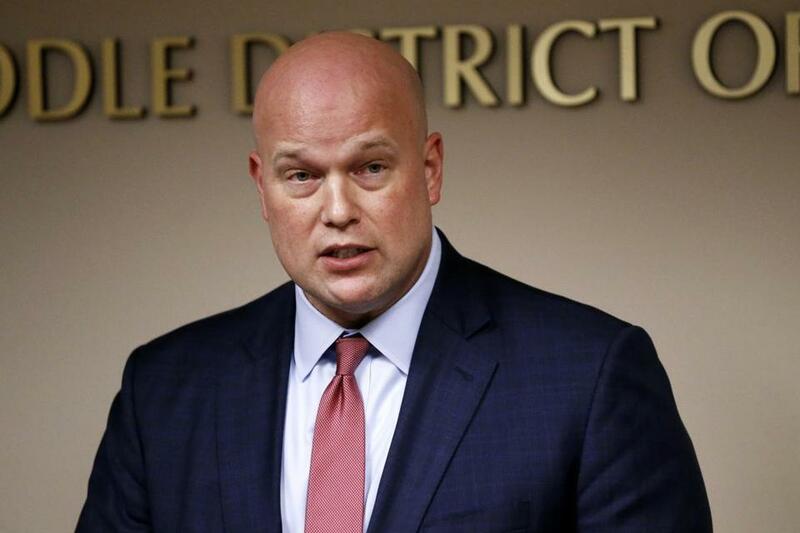 But Whitaker’s appointment, and continued service, as attorney general is perhaps his worst offense. It represents the inexorable politicization of the justice system by this president. If allowed to continue, the rule of law in America cannot survive.